This wallpaper I started last year (09). I knew the scan would be a little interesting to work with but I created this wallpaper for my own MoonMama. This series has some meaning for the two of us. So, when I decided to make her a new spring wallpaper that she'd actually, probably, like. 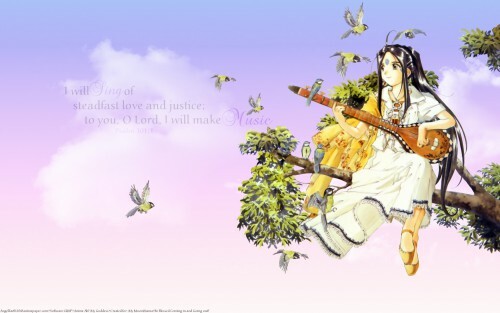 I knew that this scan of Skuld would be perfect. The background was a lot harder to decide on then you'd think. From her position on the limb. I could have gone with a few different options but I thought a more suddel and heavenly aspect would work a lot better and smoother for this wall. So, I hope this wallpaper brightens things up a bit for your local desktop! This is stunning, and wonderfully one of a kind.